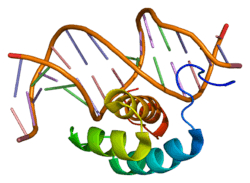 Homeobox protein Hox-A7 is a protein that in humans is encoded by the HOXA7 gene. In vertebrates, the genes encoding the class of transcription factors called homeobox genes are found in clusters named A, B, C, and D on four separate chromosomes. Expression of these proteins is spatially and temporally regulated during embryonic development. This gene is part of the A cluster on chromosome 7 and encodes a DNA-binding transcription factor which may regulate gene expression, morphogenesis, and differentiation. For example, the encoded protein represses the transcription of differentiation-specific genes during keratinocyte proliferation, but this repression is then overcome by differentiation signals. This gene is highly similar to the antennapedia (Antp) gene of Drosophila. ↑ McAlpine PJ, Shows TB (Aug 1990). "Nomenclature for human homeobox genes". Genomics. 7 (3): 460. doi:10.1016/0888-7543(90)90186-X. PMID 1973146. ↑ Scott MP (Dec 1992). "Vertebrate homeobox gene nomenclature". Cell. 71 (4): 551–3. doi:10.1016/0092-8674(92)90588-4. PMID 1358459. 1 2 "Entrez Gene: HOXA7 homeobox A7". Balling R, Mutter G, Gruss P, Kessel M (1989). "Craniofacial abnormalities induced by ectopic expression of the homeobox gene Hox-1.1 in transgenic mice.". Cell. 58 (2): 337–47. doi:10.1016/0092-8674(89)90848-9. PMID 2568891. Acampora D, D'Esposito M, Faiella A, et al. (1990). "The human HOX gene family.". Nucleic Acids Res. 17 (24): 10385–402. doi:10.1093/nar/17.24.10385. PMC 335308 . PMID 2574852. Boncinelli E, Acampora D, Pannese M, et al. (1990). "Organization of human class I homeobox genes.". Genome. 31 (2): 745–56. doi:10.1139/g89-133. PMID 2576652. Verlinsky Y, Morozov G, Gindilis V, et al. (1995). "Homeobox gene expression in human oocytes and preembryos.". Mol. Reprod. Dev. 41 (2): 127–32. doi:10.1002/mrd.1080410202. PMID 7654365. Apiou F, Flagiello D, Cillo C, et al. (1996). "Fine mapping of human HOX gene clusters.". Cytogenet. Cell Genet. 73 (1-2): 114–5. doi:10.1159/000134320. PMID 8646877. Knoepfler PS, Calvo KR, Chen H, et al. (1998). "Meis1 and pKnox1 bind DNA cooperatively with Pbx1 utilizing an interaction surface disrupted in oncoprotein E2a-Pbx1.". Proc. Natl. Acad. Sci. U.S.A. 94 (26): 14553–8. doi:10.1073/pnas.94.26.14553. PMC 25052 . PMID 9405651. Min W, Woo HJ, Lee CS, et al. (1998). "307-bp fragment in HOXA7 upstream sequence is sufficient for anterior boundary formation.". DNA Cell Biol. 17 (3): 293–9. doi:10.1089/dna.1998.17.293. PMID 9539109. McIlhatton MA, Bremner P, McMullin MF, et al. (1998). "Sequence characterisation and expression of homeobox HOX A7 in the multi-potential erythroleukaemic cell line TF-1.". Biochim. Biophys. Acta. 1442 (2-3): 329–33. doi:10.1016/s0167-4781(98)00170-5. PMID 9804983. "Toward a complete human genome sequence.". Genome Res. 8 (11): 1097–108. 1999. doi:10.1101/gr.8.11.1097. PMID 9847074. Dias Neto E, Correa RG, Verjovski-Almeida S, et al. (2000). "Shotgun sequencing of the human transcriptome with ORF expressed sequence tags.". Proc. Natl. Acad. Sci. U.S.A. 97 (7): 3491–6. doi:10.1073/pnas.97.7.3491. PMC 16267 . PMID 10737800. Kim MH, Jin H, Seol EY, et al. (2000). "Sequence analysis and tissue specific expression of human HOXA7.". Mol. Biotechnol. 14 (1): 19–24. doi:10.1385/MB:14:1:19. PMID 10911612. La Celle PT, Polakowska RR (2001). "Human homeobox HOXA7 regulates keratinocyte transglutaminase type 1 and inhibits differentiation.". J. Biol. Chem. 276 (35): 32844–53. doi:10.1074/jbc.M104598200. PMID 11435435. Kosaki K, Kosaki R, Suzuki T, et al. (2002). "Complete mutation analysis panel of the 39 human HOX genes.". Teratology. 65 (2): 50–62. doi:10.1002/tera.10009. PMID 11857506. Scherer SW, Cheung J, MacDonald JR, et al. (2003). "Human chromosome 7: DNA sequence and biology.". Science. 300 (5620): 767–72. doi:10.1126/science.1083423. PMC 2882961 . PMID 12690205. Hillier LW, Fulton RS, Fulton LA, et al. (2003). "The DNA sequence of human chromosome 7.". Nature. 424 (6945): 157–64. doi:10.1038/nature01782. PMID 12853948. Bertrand FE, Spengeman JD, Shah N, LeBien TW (2004). "B-cell development in the presence of the MLL/AF4 oncoprotein proceeds in the absence of HOX A7 and HOX A9 expression.". Leukemia. 17 (12): 2454–9. doi:10.1038/sj.leu.2403178. PMID 14562113. Ota T, Suzuki Y, Nishikawa T, et al. (2004). "Complete sequencing and characterization of 21,243 full-length human cDNAs.". Nat. Genet. 36 (1): 40–5. doi:10.1038/ng1285. PMID 14702039.